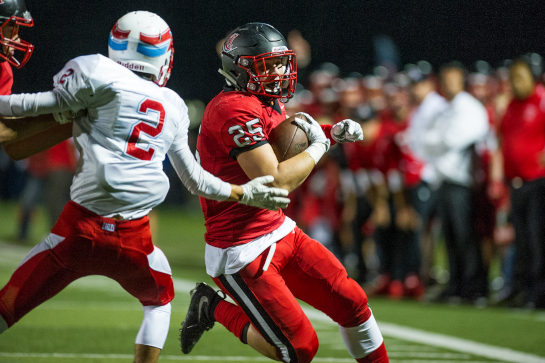 The Clackamas Cavaliers rolled to a 38-22 Three Rivers Conference victory over Centennial to keep their 2015 record unblemished at 5-0 (3-0 in conference). 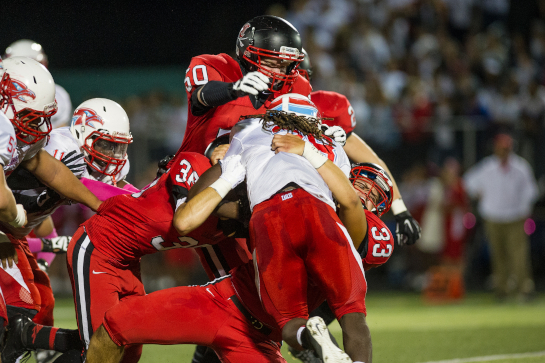 Centennial started their season with more promise in many years with three straight high-scoring wins, however the Eagles traveled to Cavalier Stadium after a 42-6 loss to Central Catholic. Centennial got on the board first with a 13 yard touchdown run midway through the first quarter from quarterback Trevor Thornton. Clackamas scored the next four touchdown, added a Drew Dayton fieldgoal and one more touchdown off a 25 yard pass reception by Alex Hern with 1:39 left in the third quarter. 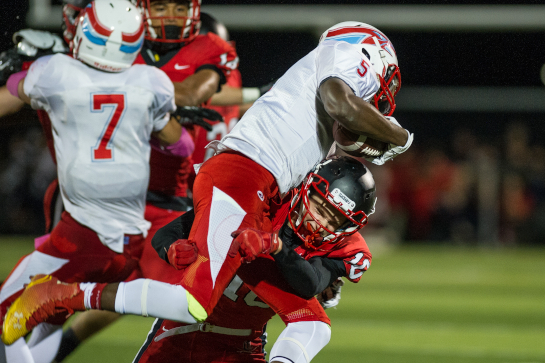 Centennial attempted to claw its way back into the game with two rushing touchdowns of 50 and 35 yards by Shawn King, but the Cavaliers' defense held strong to close out the game securing the win. 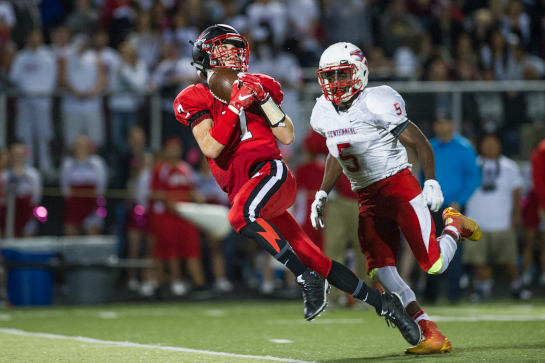 Clackamas wide receiver David Benintendi (7) pulls down a 45 pass completion down to the eleven yard line of Centennial with 4:06 left in the second quarter. 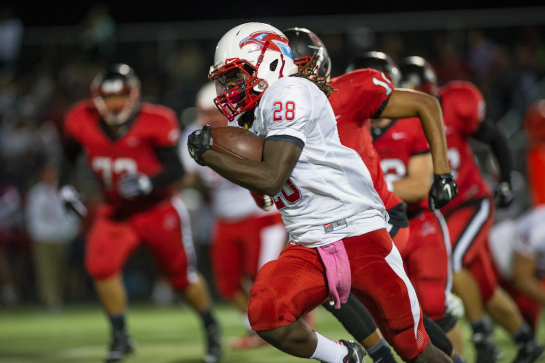 Centennial running back Jesse Porter (28) runs for a five yard gain late in the first quarter. Clackamas defensive linemen Cole Loboy (33), Joe Leontyuk (36) and Devon Riddle (50) smother Centennial running back Jesse Porter (28) at the line of scrimmage during a first quarter drive. Clackamas running back Richie Mock-Seratt (25) runs for an eight yard gain down to the Centennial four yard line with 11:39 left in the second quarter. 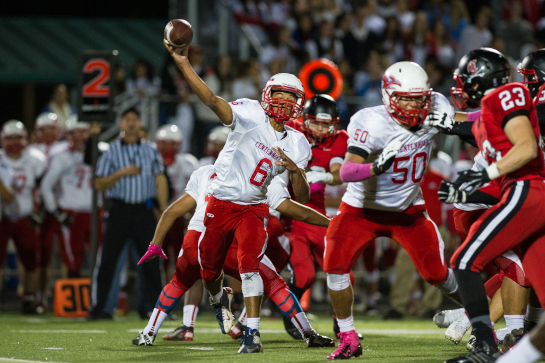 Centennial quarterback Mychael Kane (6) throws a screen pass to Jesse Porter during a second quarter drive. Clackamas defensive back Jakob Walter (10) wraps up Centennial running back Shawn King (5) to bring him down short of a first down during a second quarter third down play. 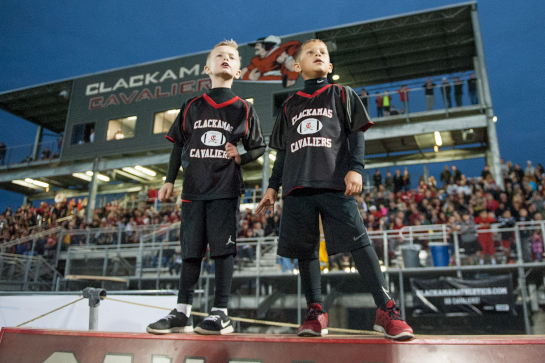 Two Clackamas ball boys stand atop the team bench to get a better view of the action during the Cavaliers homecoming game against Centennial.